Karl and I were camped just off Darwin Road in the Darwin Hills south of SR190. Having spent the past few days driving some rough roads in Tom Becht's Jeep Wrangler, today would be far more tame, vehicular-wise. Our first item on the agenda was an unnamed summit near where we'd parked, something we'd spied at the end of the previous day. Up by 6a, we were on our way to the summit only 2/3mi distance half an hour later. Our plan was to reach the summit in time for sunrise. It was just light enough to forgo headlamps as the eastern sky began to glow orange and yellow with the coming day. It took little more than 20min to reach the summit where we found a good-sized cairn of rocks but no register that we could locate. The sun rose as we were already starting back, but cloud layers soon had it obscurred as it would remain for much of the day. The fog and clouds from the previous day had not dissipated overnight. The sunrise extravaganza with pristine summit views was not to be had. Having dispensed with the warmup summit in less than an hour, we drove back out to SR190 and then west into the Owens Valley alongside the southern edge of Owens Lake. Later I learned this is described as 508 Peak in Courtney Purcell's Rambles & Scrambles, 2nd Ed. Later yet, I learned that the SE summit we visted was NOT the highpoint as reported by Richard Carey who used a sight level to determine the highpoint was the NW summit. The main event for the day was the hunt for the elusive Lakeview Peak. A year earlier, Tom and I had intended to include this summit in our tour of Joshua Flat. Zdon's description of the summit was not easily reconciled with the topo map and the elevation given for it did not match any map features. We never found it. In the interrim, I had purchased a copy of Walt Wheelock's old Desert Peaks Guide which gave some additional clues. Seems Zdon simply copied the incorrect elevation from Wheelock along with the same unclear description of it being connected by an easy ridge to Apex Peak. I had a better idea where to find the peak and wanted to give it another go. The route Tom and I had taken had been a long one and not one I wanted to repeat so soon, but an entirely different route from the north starting at Owens Lake looked reasonable and it was this route that I focused on. It would conveniently allow us to pick up another peak in Wheelock's booklet, Sugar Loaf. The outing would be more than 12mi and 3,000ft of gain, all cross-country. The terrain is open and only lightly vegetated, making the cross-country nearly as good as a trail. We started just after 8a in a fog but after climbing a first low rise we began to find our way above it. Snow-dusted Olancha Peak on the Sierra crest to the west made for a nice backdrop on our right. Behind us, Owens Lake was shrouded in the same thin fog layer we had started in, hiding the dry lakebed from view. Because of the low clouds and haze we could not see our first target, Sugar Loaf, until we were within about half a mile. Navigation was not problematic because we had the summit dialed into the GPS and could pick out the right series of ridgelines to travel whether we could see the summit or not. After an hour and a half's time we reached the top where we found a generic USGS benchmark and a register. An old scrap from Erik Siering dated to 1999, but a more recent notepad was left by Trona resident Thomas Gossett in 2007. His "Praise the Lord" sentiments found in many of his register entries are in sharp contrast to the attempted murder/suicide he was involved in a few years later. The desert has its share of characters, to be sure. We left the summit of Sugar Loaf via the opposite side, dropping several hundred feet to a saddle before starting up a gentle ridgeline to higher ground. We followed this and other connecting ridges for more than an hour, past a number of claim boundaries that are found, literally, all over the place. The hills here are composed of all sorts of interesting rocks and have been a magnet for prospectors in times past, before this became part of the Coso Wilderness. About an hour from Sugar Loaf we finally got a view of where I thought Lakeview should be. It is marked by an outsized block of rock on its north side, visible from more than a mile away. It would take about half an hour's further effort to finally reach the top. A glass jar tucked among the rocks was our first clue that we had found the right summit. I admitted to being a bit nervous and let Karl do the honors of opening it up. Barbara and Gordon had led a party of 12 Sierra Clubbers to the summit in 1978 and identified it as Lakeview Peak (success!). The next visitor, a Kansas geology student, left a 1995 entry. Erik Siering and Bob Sumner visited in 1999, with Thomas Gossett's 2007 visit making the last entry. Ours was only the 5th party in 37 years. Haze marred much of the distant views, but nearer in to the south I could easily identify the three "pexes" ( Apex, Bpex & Cpex) that Tom and I visited the previous year. We took a longish break at the summit, having a snack and working out a plan for the return. We both felt like exploring new ground rather than returning the same way, the only decision was whether to loop around to the west or the east. Had I done a bit more research I would have steered us about three miles to the west and Red Ridge, another Wheelock summit, but instead we settled on a looping route to the east, descending a prominent ridge in that direction that would minimize the flat walking across the desert and maximize our time at higher elevation along the ridges. It was on the descent that we really became aware of the variety of rock coloring found in these hills, with orange-red, yellow and purple varieties among the most interesting. We would periodically stop to examine these, once again wondering out loud and dreaming of finding that nugget or vein of gold bearing rock that kept the prospectors of old motivated. Our ridge ended at the confluence of several washes and we followed the combined wash out across the alluvial plain towards Owens Lake and our vehicles. It was 2:15p by the time we returned, a modestly full day. I tried to talk Karl into one more summit, but he had gotten his fill ("just the right amount", in his words) and wanted to get back to Santa Cruz earlier rather than later. I was on my own for the last one. Red Hill is a small cinder cone located adjacent to US395 about 20mi south of its junction with SR190. I had driven by the hill many times and had been at the same Fossil Falls highway exit when I climbed nearby Volcano Peak. I was saving it for just such a day when I had a few hours of daylight to burn and I was on my way from, or in this case, to home. My first effort involved driving into the quarry site found on the south side of Red Hill. A sign there says all visitors must check in at the office. I deemed myself qualified as a visitor and went to check in. The place looked mostly deserted, a lone SUV parked outside a mobile trailer. I knocked, heard a faint reply that I guessed was an invitation to enter, and went inside. I found a woman in one of the walled offices looking at me like I wasn't what she expected, or hoped for. I explained why I was there and asked if it was ok to climb Red Hill. Realizing I was not there for any real business that she needed to be interrupted for, she politely but firmly informed me this was out of the question in a manner that left no room to negotiate. Back outside I went. I was not so easily deterred, however. I drove back out the gate and then around to the east side of Red Hill where I found a pool of water from the most recent rain a day earlier. A fence separated me from the quarry property, running towards Red Hill and then apparently ending at its base. It wasn't at all clear where the quarry boundary was located (later I found that the summit and most, if not all the route I took was on BLM lands). I figured I could just climb it from this side, keeping more to the northeast so that I wouldn't be so obviously visible from the quarry should someone happen to look outside a window or while going to her car. The short climb would take less than half an hour to reach the summit, but it was a good workout. The moderately steep slopes were composed of gravel-sized volcanic rock, the same stuff the quarry was collecting to pulverize and sell for commercial purposes. Each step would sink in some, not quite as bad as a sandy slope, but far from the surer footing afforded by more solid rock. I reached the cone's perimeter a few hundred yards north of the highpoint, dutifully walking amongst the more solid and interesting rock found along the way. I found a small, simple survey marker inscribed with "RED HILL" and nothing else to give away its origin. 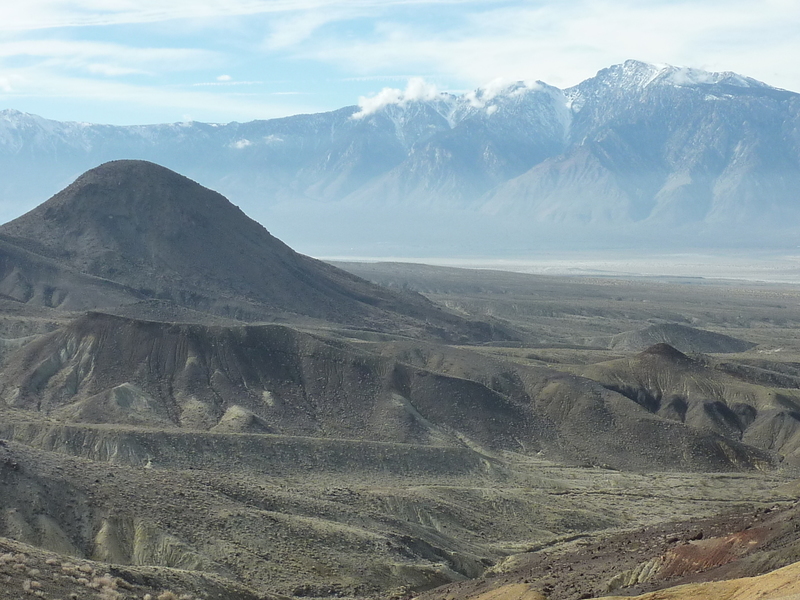 The summit provides nice views of the adjacent Sierra to the west (with the next day's summits, Chukkar and Deer, prominently displayed), the Owens Valley and the Inyo Mtns to the north, the Coso Range to the east. Is this new? No story appears on the page. Thanks, that did the trick. We weren't even close last year!